Gulam Maidin Mohammed? , Asatulla Mohammed? 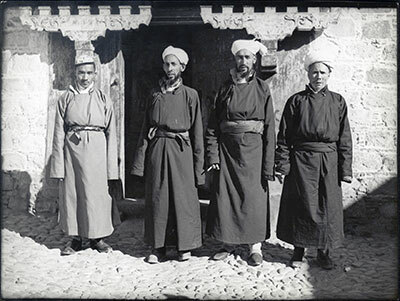 Four representatives of the Ladakhi moslems in Lhasa. The four men stand in front of a carved door lintel. Each is wearing a coat or chuba, but with a cloth belt wound around the middle. Three are wearing turbans made of white cloth, whilst the fourth wears a small, decorated hat. Exhibition - This image appeared in the 2003 Temporary Exhibition at the Pitt Rivers "Seeing Lhasa: British Depictions of the Tibetan Capital 1936-1947"
The Tibet Album. "Ladakhi Moslems in Lhasa" 05 Dec. 2006. The Pitt Rivers Museum. <http://tibet.prm.ox.ac.uk/photo_1998.131.284.html>.